The Department of Dyes and Chemical Engineering (DCE) is planning to organize various types of workshop to improve soft skills of the students. 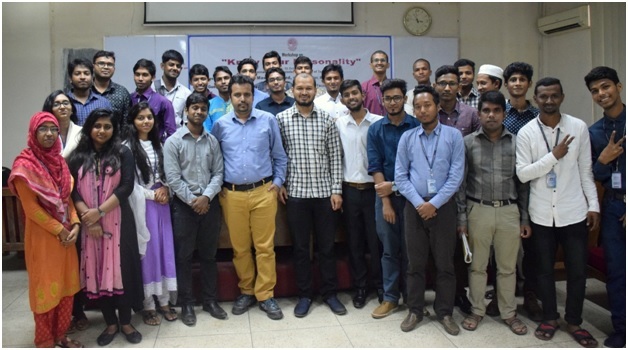 In its first workshop held at 10th October 2017 in the university seminar room.Dr Mohammad Abbas Uddin, Assistant Professor facilitated the workshop ‘know Your Personality’, perhaps the very first for the university students in Bangladesh.The Chief Guest of the workshop was Prof. Engr. Mashud Ahmed, Honorable Vice-Chancellor and the Special Guest was Prof. Dr. Engr. Md. Zulhash Uddin, Dean, Faculty of Textile Chemical Engineering. Prof. Zulhash Uddin thanked Deparment of DCE to organize the event which is extremely important for the betterment of students in order to improve their soft skills. In his speech the Vice Chancellor showed his special interest and commitment to this department and further explained the necessity of soft skills for BUTEX students in the aspect of their professional life. He expressed the students must have very much proficiency in english language, appropriate communication and presentation skills, excellent computer literacy, etc. along with their academic knowledge. He appreciated DCE to organize this workshop and advised the department to continue this kind of event frequently in the upcoming days. Prof. Dr. Mohd. Forhad Hossain, Head, Department of DCE was the Chairperson in this program. Mr. Mustafijur Rahman, Lecturer, DCE was the Moderator of this event. Figure 1: (from left to right) Prof.Dr.Mohd.Forhad Hossain(Head, DDCE), Prof.Engr.Mashud Ahmed(Vice-Chancellor, BUTEX), Prof. Dr. Engr. Md, Zulhash Uddin (Dean,FTCE) and Dr. Mohammad Abbas Uddin (Assistant Professor, DDCE) during the Workshop titled “Know Your Personality” organized by Department of Dyes and Chemical Engineering, BUTEX. In the second phase of the program, Dr. Mohammad Abbas Uddin conducted the workshop. He introduced Myers-Briggs Personality Type Indicator (MBTI), the most widely used behavioral assessment in the world which offers insights into personality and preferences. Develop an appreciation for individual gifts and strengths. Learn how to capitalize on yours and others’ strengths to enhance your team’s performance. Identify areas or opportunities for personal or professional development. The workshop is carried out with the level 1 term 2 students of DCE with plenty of activities and exercises which includes ball throwing, handwriting game, body movement etc. The MBTI is a framework and a process that can help a student to confirm how they like to do things, their strengths and lifestyle. This workshop is particularly helpful for identifying and learning about the personality type and way to develop the strength and non-preferred options as the students graduate.